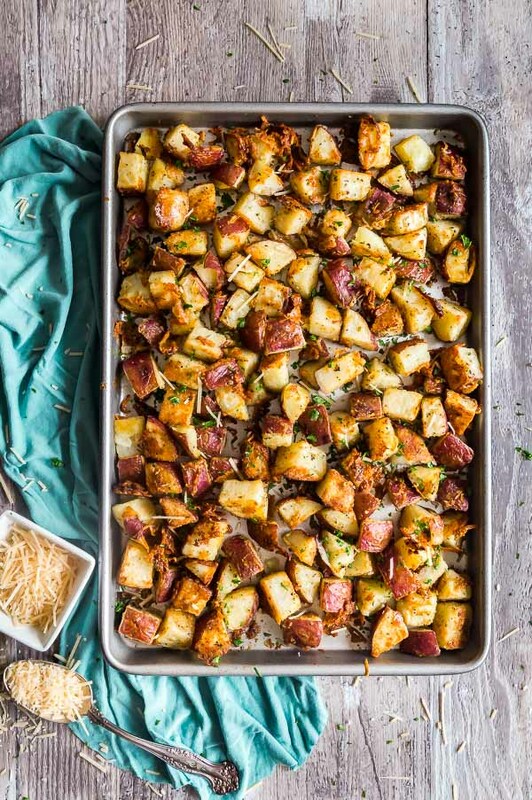 These Parmesan Garlic Roasted Potatoes are perfectly crispy and cheesy. 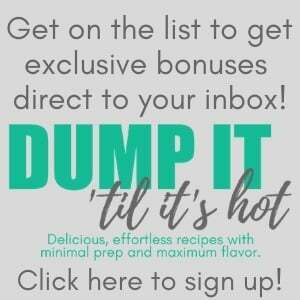 Your family will fight for seconds! 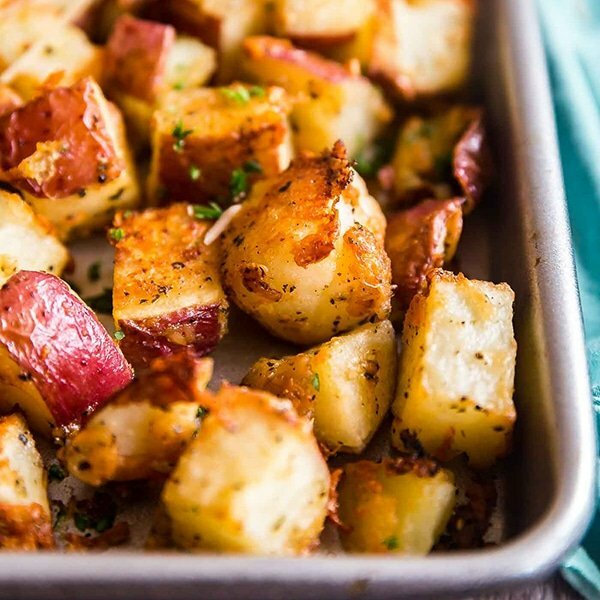 These Parmesan Garlic Roasted Potatoes will rock your world. 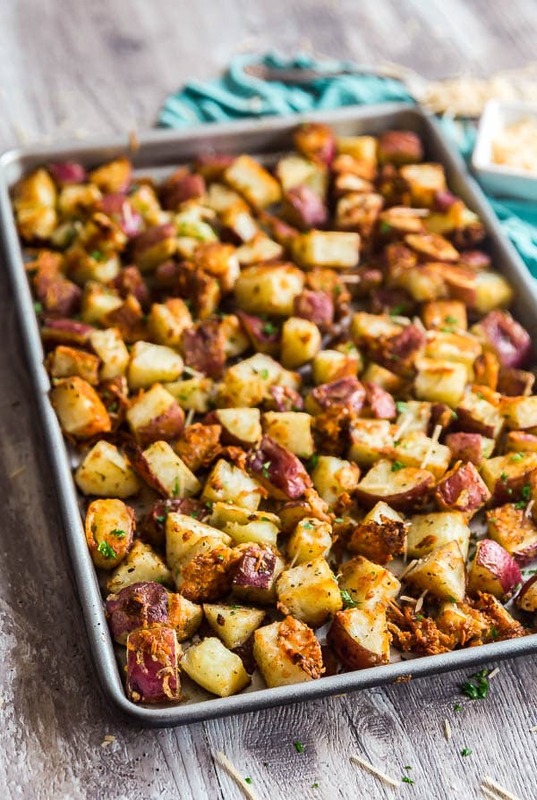 Do you absolutely love crispy and flavorful roasted potatoes? I cannot think of a more classic side dish to go well with pretty much any dinner you make! Growing up we would fight over the crispiest potatoes, which is a trait I inherited from my dad because he’s the King of Crispy Potatoes! 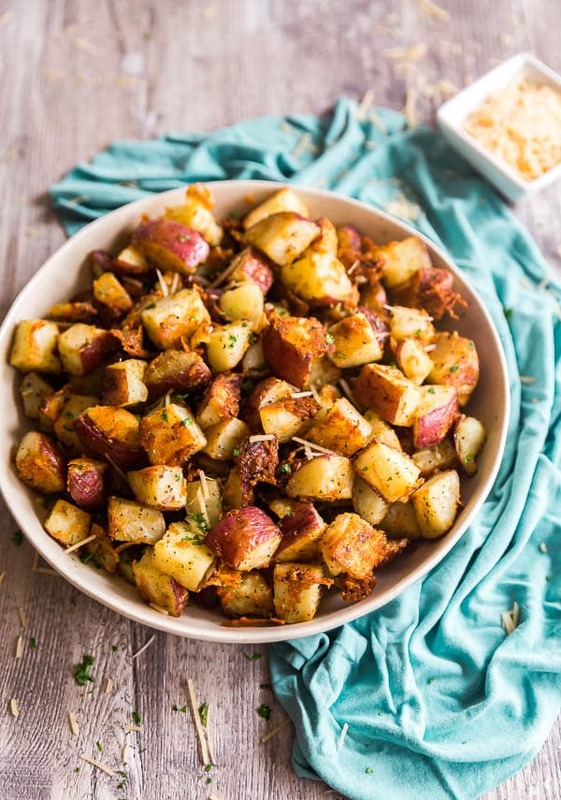 I’ve been trying to develop more simple side dish recipes you require minimal work on your part with maximum flavor and these potatoes are a major winner in both respects! 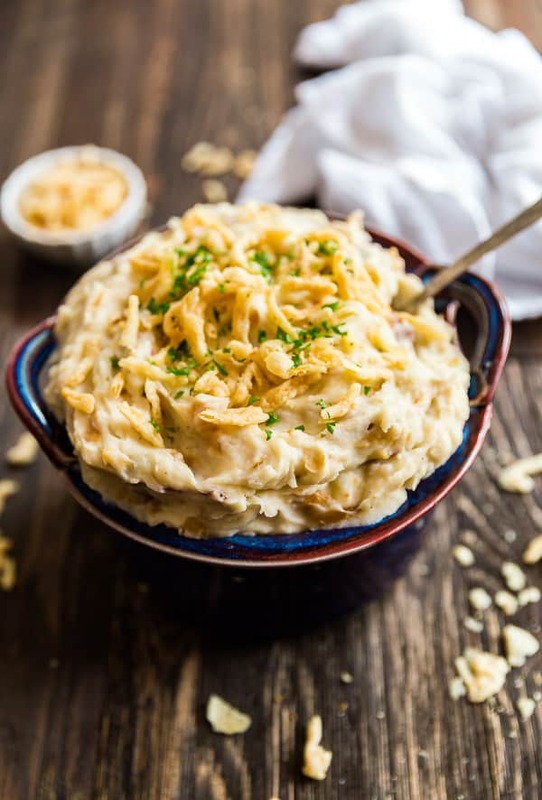 For this recipe, I opted to use parmesan cheese that finely shredded as opposed to finely-grated because I wanted them to clump together a bit to have alllll the crispy bits. Because crispy bits are always a good idea. To make these I started out by dicing the potatoes to all be the same size for even cooking- I went with one inch. I then mixed all the ingredients in a big mixing bowl to make sure the seasonings were evenly distributed. You’ll want to lay these out in a single layer on a well-greased sheet pan . You can line it for easier clean up but I fined that they crisp up better without a liner. The size pan I used is technically considered a half sheet (which is what you find in most home cook’s kitchens- full sheets are technically the huge ones you find in commercial kitchens). 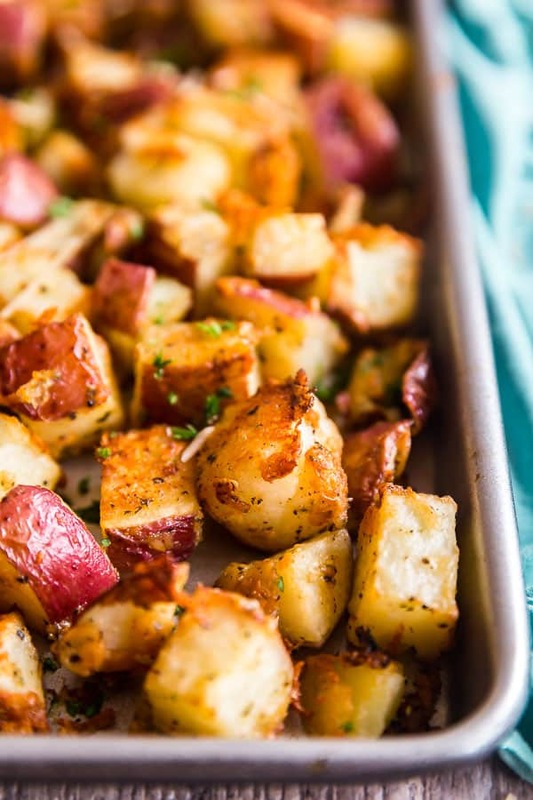 If your pan won’t fit all of the potatoes in a single layer, I’d recommend splitting them between two pans because if they’re piled on top of each other they will steam and not get as crispy. 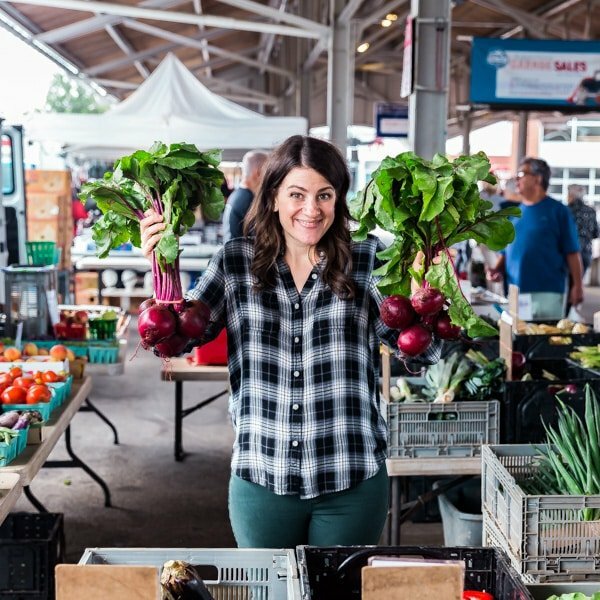 Make this to go alongside a simple meat or poultry entree for an easy weeknight meal or double it for a crowd for a dinner party or holiday get-together. Your family will be fighting for all those perfectly crispy bits! Preheat the oven to 425 degrees and lightly grease a sheet pan. 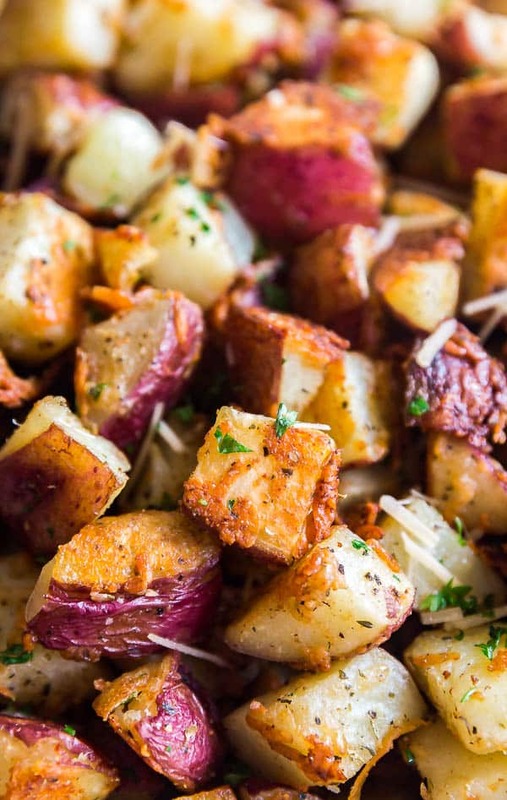 Place all ingredients into a large mixing bowl and toss until all the potatoes are evenly coated. 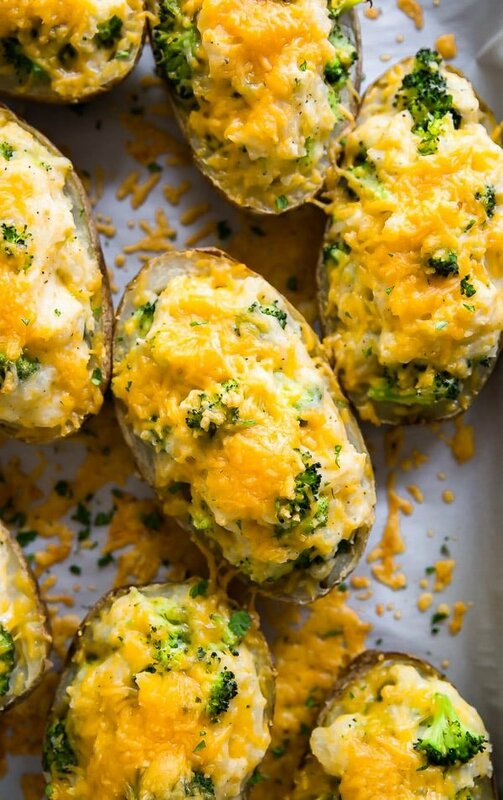 Spread the potatoes onto the pan in one even layer and scrape any remaining cheese over the top of the potatoes. Bake for 45 minutes turning twice (every 15 minutes). Turn the broiler on and broil for a couple more minutes until they're golden brown and crispy (if necessary- depending on your oven, you may not have to do this). These are best served right away, although I was surprised that they reheated better than expected- I placed them onto a pan covered in foil and baked until hot and uncovered them shortly before serving. 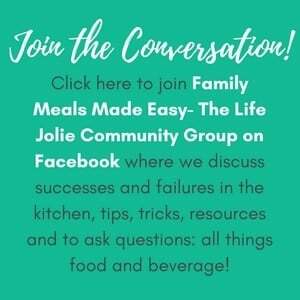 December 8, 2017 at 4:22 pm Allllll the potatoes, please. These look SO delicious- I'm already drooling just thinking about how good they'll make the house smell! December 10, 2017 at 7:46 pm Me and you both Karley! I'll take any potatoes I can get!